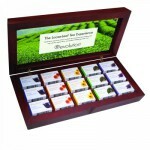 Serve Revolution Tea the right way and use one of the following presentation boxes. Surprise you family and friends with your choice for Revolution Tea. Please note that each box is empty. Choose your own flavors at the Single Serve section. Every chest is made of bamboo material. Bamboo is no wood and therefor better for the environment. Chest in White for 15 servings made of bamboo.Please note that each box is empty.Choose your own .. 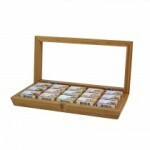 Chest in natural look for 30 servings made of bamboo.Please note that each box is .. Chest in dark for 15 servings made of bamboo.Please note that each box is empty.Choose your own f.. Chest in natural look for 15 servings made of bamboo.Please note that each box is ..